This part concludes the series providing guidance on completion of the CoC. Part 13 will deal with the electronic CoC. We trust that it will be of value as a reference document for practitioners issuing CoCs, as well as to those who may need to evaluate an issued CoC. Please be aware that where SANS 10142-1 Editon 1.8 has been referenced in this series, some numbering will be slightly different to those clauses in the recently published SANS 10142-1 Edition 2.0. 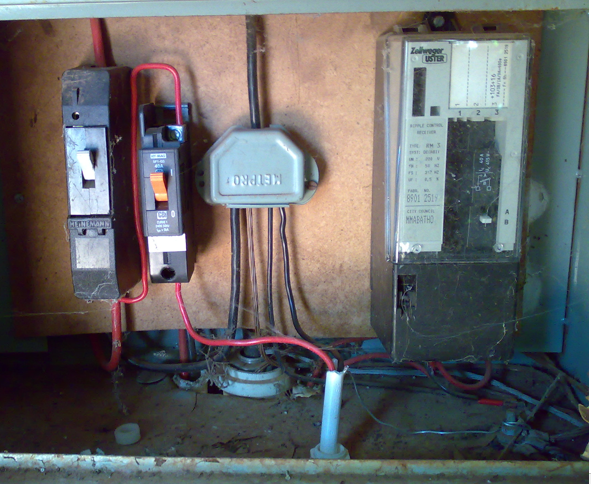 At the point of control (main switch) of the installation, determine the value, and enter this in the allocated space. In instances where the installation contains more distribution boards, or more supplies, this test must be done for each, and a copy of the ‘TESTS’ under section 4 must be completed for each. The actual reading should also be inserted into item 5 of the test portion of section 4. There are three recognised methods of determining this value. By far the easiest and best method is to measure it, which can be done instantly with a compliance meter or while testing the earth loop impedance. In instances where it is impractical to measure, or where this part is completed at the design stage, it can be calculated. It is however not recommended unless you are familiar with the methods, and all the information regarding transformer characteristics and every piece of conductor in line is available. It can take up to four folio pages of calculations. If you follow this route, be sure to attach a copy of the calculations to the CoC and keep a copy for your records as well. The third option is to obtain it from the supplier. This is probably the one single item that most registered persons get wrong! In many cases, we find that the registered person simply copies the short circuit withstand rating printed on the supplier’s breaker into the allocated space –THIS IS INCORRECT. 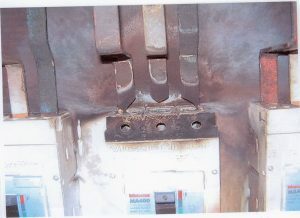 NOTE: What is printed on the breaker is the withstand rating of the installed breaker, not the PSCC of the installation! The PSCC should be smaller (able to be protected) than this withstand rating. Insert the value in the allotted space, and tick the appropriate block indicating the method of determination. The primary purpose of this test is to ensure that the neutral to earth (TN) connection at the source (transformer/generator) is intact, and continuous all the way into the installation. Please note that it requires that the test be conducted between the incoming neutral, and an earth (ground) EXTERNAL to the installation. One example of external earth would be a large screwdriver or spike stuck into a wet/damp spot on the lawn. Many electricians do this incorrectly by testing between the Earth and Neutral in the DB. Consider a TN-C-S system, in which case there will be an Earth-Neutral connection at the point of supply, which may well be right on the other side of the same wall the DB is mounted on. Accordingly, if measured between earth and neutral in the DB, effectively the resistance of the bridging conductor is measured. Consider if the Live and Neutral has become crossed somewhere in the supply, the measurement between the incoming Neutral at 230 V and earth bar (connected thereto) also at 230 V will result in a ZERO reading, falsely setting the mind at ease. 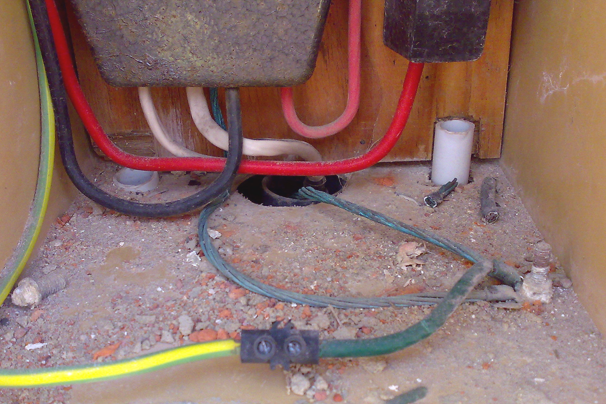 If, however, this is measured from external GROUND, the neutral will measure at 230 V, indicating a crossed connection. Obviously, this will prevent the CoC from being issued until the supplier has corrected this. 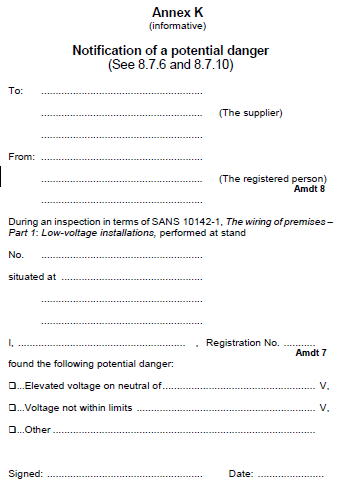 In this case, as for any instance where the reading exceeds 50V, it is required that the supply be IMMEDIATELY disconnected, and the supplier notified per annex H (previously Annex K), as shown below. 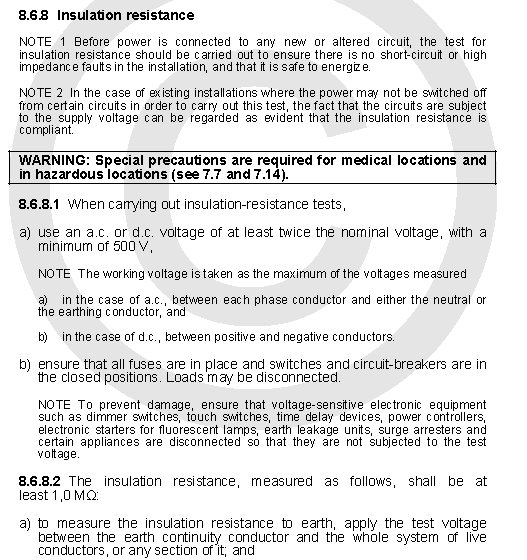 Readings up to 50 V will not prevent the CoC from being issued, but for all exceeding 25 V the supplier must also be notified per annex K (/H). Readings of up to say 6 V are not uncommon, and hold no risk, but may cause uncomfortable sensations from taps or particularly in showers, often referred to as ‘shocks’. It is recommended that any significant voltage be investigated, and the cause rectified. This measurement is done at the point of control (main switch), and because it is fed from the point of supply (meter) it is suggested that non-compliances be traced back thereto. If it is correct there, it indicates a break in the service connection, and remains the user’s (owner)’s responsibility to rectify. If the problem is confirmed at the point of supply, or upstream thereof, it indicates a problem in the supply system, and the supplier needs to correct it. Record the result in the allotted space. This test is not compulsory, and Earth resistance can be determined in accordance with SANS 10199. However, if an alternate source like a generator is installed, it has to have an earth not dependent on the supplier’s earth, and that has to be tested! 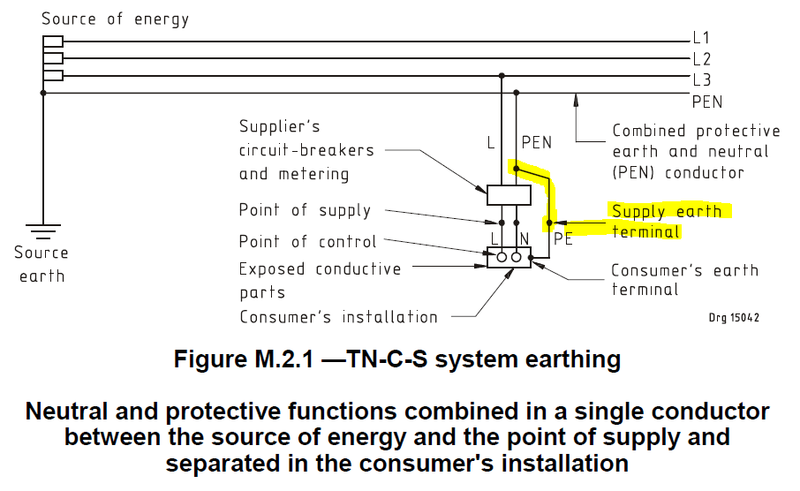 8.7.7.1 Where the supplier does not provide an earthing terminal or where an alternative supply is installed, the efficiency of the earthing system can be confirmed by this test in SANS 10199. 8.7.7.2 Where the supplier provides an earthing terminal, this test is optional. If an earth terminal is provided, write: N/A, or Not Applicable into the relevant space, otherwise insert the test result in the allotted space. 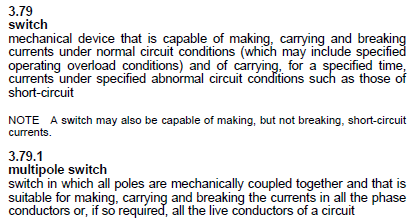 Generally, the purpose of this test is to ensure that the installation is free of potential short-circuits and would be safe to connect a supply thereto. 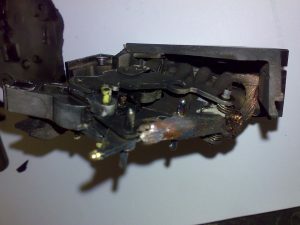 In cases where there are many connected appliances, such as fluorescent lights, which have been connected to the supply voltage and are operational, that can be taken as confirmation that there is no short-circuit present, and an insulation resistance test to prove this is considered superfluous. This is especially where it might be impractical or very onerous to disconnect many items to do this test. The test must be done between all conductors where a short may occur. Ensure that switched portions of all circuits are also tested. Test must be conducted at the higher of 500 V or twice rated voltage, and the result must exceed 1 MΩ. 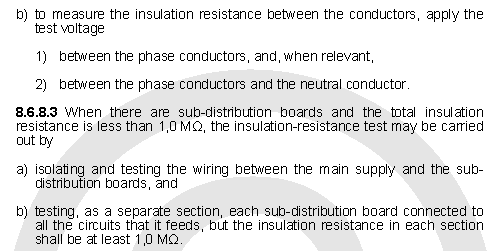 In cases where the result is lower than 1 MΩ, and the installation contains sub-DBs, the sub-DBs may be disconnected, and each part must now be tested separately and all results must exceed the 1 MΩ requirement. In such cases, the worst obtained result must be recorded on the test report. In areas where sparks or other discharges may be harmful, such as environments where there may be flammable gas present, tests like insulation resistance tests at 1000 V may cause ignition or explosions. In such cases, consider using other safer means of determination, or take steps to mitigate the risk. If not possible, you are allowed to not do this test. In some instances, there may be sensitive (electronic) equipment connected to the installation. To prevent damage thereto, it may need to be disconnected before applying excessively high test voltage, or otherwise the test may also be not done. If the installation complies, enter the result in the allotted space, or if not tested as above, insert N/A with an explanatory note, for example “Not tested; installation may not be switched off”. Primarily, the purpose of this test is to confirm that the supplied voltage corresponds to the design of the installation, and secondly that it is within the prescribed limits (230 V ± 10%), and safe to energise. Measure between Line and Neutral, for multi-phase installations, measure and record the line voltages for each phase. If compliant enter the values in the allotted space; if not, notify the supplier by submitting Annexure H, and only once rectified and re-tested, complete the test report. This test is to ensure that the installation will receive the prescribed voltage from the supplier, even while being used at full capacity. Connect as much load as available, if possible add extra load like heaters etc., and measure the load (Amps) at the same time the Line-Voltage readings are taken. Calculate what the voltage will be at full load current, and it must remain within the same limits as above (207 – 253 V). If compliant, enter the values in the allotted space, if not, notify the supplier by submitting Annexure H, and only once rectified and re-tested, complete the test report. In order to prove that the voltage loss over the installation complies to requirement of this sub clause, we need to simultaneously determine the voltage at the point of control and most suspect point of consumption under fully rated conditions. The difference may not exceed 5% of the rated voltage, this 11.5 V for a 230 V installation. Connect substantial load, for example a heater or other resistive load, to the furthest socket circuit. The total load must be the higher of 2 A or 50% of the circuit rating. Simultaneously measure the current as well as the line-neutral voltages at the points of control and consumption. Calculate what the voltage at the socket will be at full-load. For instances where there are more circuits in series, repeat for all, and add up the voltage loss for each to obtain the total loss. This total should not exceed the 5%. For multi-phase installations, repeat for each phase. If compliant enter the values in the allotted space, if not, it may be necessary to increase conductor sizes or reduce the ratings of protective devices. Use an earth leakage tester and determine the tripping value of the installed unit(s). Starting at the minimum test value, slowly increase the test (leakage) current, and note the value at which it trips. This value should be between 50% and 100% of its rated value. For 30 mA unit, between 15 and 30 mA. If the value is outside the prescribed values, the unit is defective and may need replacement. Enter the result into the allotted space. Easy, if it trips, tick the block. If it does not trip, confirm that there is power available, and that the tester actually causes it to trip. If the test button does not cause it to trip, the user will not be able to test it, thus it is faulty and needs replacement. Carry out tests as described, and if correct, tick the relevant blocks. Confirm that all switches operate as intended. Refer to definition of switches below. If compliant, tick the block below. Part 13 will cover the electronic CoC.